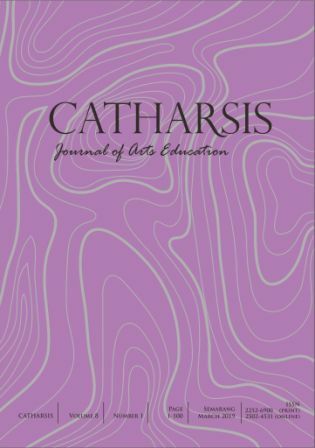 Catharsis: Journal of Arts Education published by Arts Education, Postgraduate Universitas Negeri Semarang, Indonesia provides an international forum for research in the field of the art and creative education. It is the primary source for the dissemination of independently refereed articles about the visual arts, creativity, crafts, design, and art history, in all aspects, phases and types of education contexts and learning situations. The journal welcomes articles from a wide range of theoretical and methodological approaches to research, and encourages submissions from the broader fields of education and the arts that are concerned with learning through art and creative education.